For an interview with Penny Nance, please contact Janae Stracke at [email protected] or 712-269-1724. The House is back in session this week for the first time after elections! Newly elected representatives are here in D.C. this week for their orientation. Returning Members of Congress are having initial meetings on what to do to fund the government for the rest of the fiscal year which began on October 1. Currently, the government is funded through December 11. Leaders will decide whether they will pass an omnibus that will go the entire year and allows changes to be made on how money is spent or whether they will pass another continuing resolution that keeps the money being spent on current programs. Concerned Women for America Legislative Action Committee is working with House leadership on efforts to try to include conscience protections in whichever spending vehicle moves in the House. California Abortion: On August 22, the California Department of Managed Health Care (DMHC) issued a directive mandating that all plans under its authority include coverage for all legal abortions, even if a plan that had previously excluded abortions had been approved by DMHC. This mandate includes religious institutions like churches and is contradictory to the Weldon pro-life rider passed annually which prohibits state or local governments that receive federal funds from discriminating against a health care entity (including health insurance plans) because they do not include abortions. CWALAC is working with Representatives Diane Black (R-Tennessee), John Fleming (R-Louisiana), and Andy Harris (R-Maryland) to get Members of Congress to sign on to a letter to Health and Human Services Secretary (HHS) Sylvia Burwell, urging the agency to act quickly in response to DMHC’s violation of the Weldon amendment. Because it is unlikely that HHS Secretary Burwell will act expediently, CWALAC is urging House leadership to make permanent the Weldon amendment and include the Abortion Non-Discrimination Act in whichever spending vehicle will be considered on the House floor. The House is expected to finish its legislative business and wrap up. It may reconvene if needed based upon Senate action. GAO Report: Several House leaders requested that the Government Accountability Office (GAO), an independent watchdog agency, investigate abortion in ObamaCare. This week, the GAO released its report that showed that all Americans, even in states that have excluded abortion from their exchanges, are being forced to subsidize abortion services. The report also discovered that when Americans tried to determine whether abortion coverage is included in their plan, that information was not readily available. To read the full report online, click here. 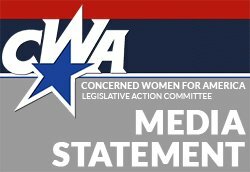 To read Concerned Women for America’s (CWA) press release, click here. Benghazi Hearing: This week, the House special committee investigating the Benghazi terrorist attacks held its first public hearing. The hearing focused on determining what progress has been made since the attacks in implementing security improvements at U.S. embassies and other missions abroad. Preserving Welfare for Needs Not Weed Act: The House by voice vote passed legislation that closes a loophole and ensures that taxpayers will not be funding welfare recipients’ marijuana use. Welfare benefits were designed to help low-income families make ends meet. These benefits should not be used to subsidize drug use. Congress has prohibited welfare funds from being used for alcohol and gambling. Similarly, taxpayer monies should not be used for marijuana. Concerned Women for America Legislative Action Committee (CWALAC) supported this legislation and will include this vote in our annual scorecard. A provision to extend expiring Department of Defense activities, including counter-drug operations, support to the Office of Security Cooperation in Iraq, and rewards for assistance in combating terrorism. A provision to continue a surge in funding for State Department programs to counter regional aggression toward Ukraine and other former Soviet Union countries. Several provisions to ensure appropriate treatment of veterans and continued oversight of the Department of Veterans Affairs, such as additional funds for disability claims processing and funds for investigations into potential improper conduct, including “wait list” and “whistleblower” allegations. A provision allowing funding flexibility for Customs and Border Protection and Immigration and Customs Enforcement to maintain staffing levels, border security operations, detention space, and immigration enforcement activities. Provisions to address the recent Ebola crisis, including additional funding to accelerate HHS research on Ebola therapies and additional funding for the Centers for Disease Control’s response to the growing outbreak in Africa. A provision allowing additional funds to offset food price increases in the Commodity Supplemental Food Program to ensure that no current recipients are removed from the program. A provision allowing funding flexibility to maintain weather satellite programs, ensuring the continuation of data for weather warnings and forecasts, including forecasts of severe weather events. A provision allowing the continuation of current funding for the Temporary Assistance to Needy Families (TANF) program. A provision extending the operating authority for the Export-Import Bank through June 30, 2015. A provision extending the Internet Tax Freedom Act through the period of the CR ending on December 11, 2014. ISIS: As part of the continuing resolution to fund the government, the House approved President Obama’s plan to arm and train rebels in Syria to fight ISIS. The vote was 273-156. 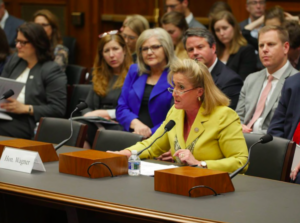 This was not a comprehensive plan to address the situation and CWALAC is continuing to urge Congress and the Administration to do more to protect women, children, and our fellow Christians in the region. The House this week held more hearings on ISIS, including hearings in the Intelligence and Armed Services Committees. The House returned to Washington, D.C., this week after its August recess, and it was a busy week! ISIS: This week President Obama briefed House Members of Congress on the ISIS situation. As part of that briefing, President Obama has requested $5 billion in counter-terrorism funds to fight ISIS. However, the terror posed by ISIS requires a more comprehensive solution. Two House committees also held hearings this week about ISIS. Employee Health Care Protection Act: The House passed the Employee Health Care Protection Act by a vote of 247-167, which included 25 Democrats. This legislation fulfills the promise made by President Obama by allowing American workers to keep their health plans. Concerned Women for America Legislative Action Committee (CWALAC) sent a letter of support to the Hill. Child Welfare Provider Inclusion Act: This legislation will ensure that faith-based adoption and foster-care providers are not forced out of the adoption and foster-care services because of the religious belief that children belong with both a mother and father. Listen here to Rep. Mike Kelly (R-Pennsylvania) discuss his bill. Act Now: Please call your representative and ask him/her to support H.R. 5285, the Child Welfare Provider Inclusion Act. Continuing Resolution: The House will consider legislation that will fund the government through early December. This spending bill will protect all of our current pro-life provisions. Benghazi: Next Wednesday, the House Benghazi Select Committee will hold its first public hearing to determine what the Obama Administration has done to improve security at U.S. embassies since the attack two years ago. It does not look like this hearing will focus on why U.S. forces were directed not to respond nor will the focus be to seek answers about why administration officials lied about the nature of the attack. CWALAC will continue to push to get answers to these questions surrounding Benghazi. By a vote of 370-40, H. Con. Res. 105 passed the House on July 25. This concurrent resolution states that the president may not, under any circumstances, deploy or maintain U.S. Armed Forces “in a sustained combat role” in Iraq without specified and enumerated Congressional authorization. Both Republican and Democratic congressmen rallied behind this measure, hoping to send a strong, unified message to the current administration. Placing a necessary check on the president’s war-making powers, H. Con. Res. 105 will require that President Obama first go to Congress for permission before employing tactics that could potentially escalate and intensify any future military actions or conflict in Iraq. Lawsuit against President Obama: A monumental and hotly contested piece of legislation, H. Res. 676 was taken up by the House this week and, on Wednesday, passed nearly along party lines. This bill authorizes Congress (via the Speaker of the House) to initiate litigation against the current administration for unconstitutional actions. Specifically, this bill empowers Congress to file a lawsuit against the president to address and amend his failure to uphold his constitutional duties in regards to the individual mandate in ObamaCare. Religious Freedom: Rep. Mike Kelly (R-Pennsylvania) sponsored the Child Welfare Provider Act of 2014 and introduced it in the House of Representatives on Wednesday. This bill will grant faith-based child welfare providers, such as ChildShare, Catholic Family Services, FosterHope, and the Salvation Army, the freedom to select future foster and/or adoptive parents based on their religious belief that children belong with both a mother and a father. In some states, such as Massachusetts, California, and Illinois, as well as the District of Columbia, faith-based child welfare providers have been coerced by state law to leave their convictions at the door and, in turn, been forced to license unwed and homosexual couples as foster/adoptive parents. The Child Welfare Provider Act legislation upholds our fundamental “first freedom” and protects an individual’s right (and the institutions they operate) to act upon their moral and religious convictions without fear of “adverse actions” by the government. Ever since the concept of this bill was discussed a couple of years ago, Concerned Women for America Legislative Action Committee has been on the front lines as a supporter of this legislation. We look forward to seeing this bill move forward with bipartisan support. 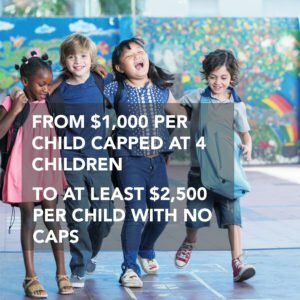 Take Action: Please urge your representative to cosponsor and support the Child Welfare Provider Act, H.R. 5285. To find you representative, please click here.